Alternate title: Progenitor - What I've Been Doing Instead Of Coding. I've spent a lot of time playing CCGs. A lot. From the original Star Wars game (Decipher), through Legend Of The Five Rings (AEG), to the industry mainstay that is Magic: The Gathering (Wizards Of The Coast), these games have* a big draw on me. 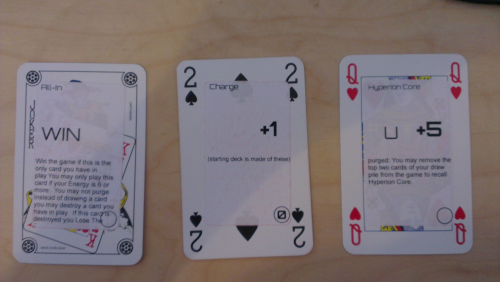 The (fairly) recent genre of deck-building games, kick-started by Dominion, draw on a portion of what makes those games so great, and so I had a go of them too. Massive amounts of down-time. Each player's turn could take a while, and you had to sit through every other players turn, doing nothing, until it finally came back round to you and you got to do something once more. 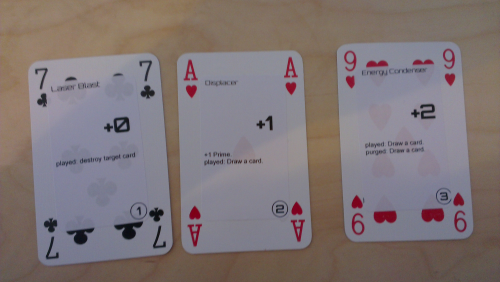 After trying to come up with a house rule to try and minimise problem 1 in the game we'd played the night before, and failing, I decided to just make my own deck-builder, with the intention of tackling those two problems: make a deck-building card game in which there is little down-time and which has lots of interaction between the players. 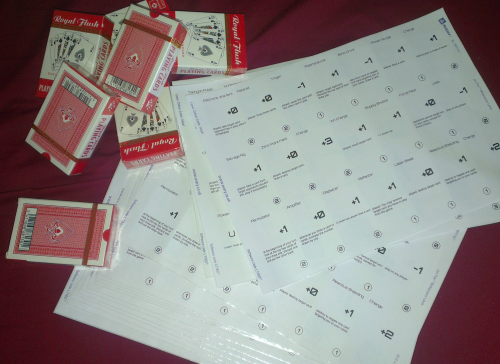 One sleepless night later I had the core of what would become the rules for Progenitor, and the next day I went out and bought 9 decks of regular playing cards and a stack of printable adhesive labels. Cards really need artwork to easily differentiate them! Thus began the cycle that is still going on now: get friends to come round and play -> see what isn't working -> alter rules/cards and reprint. At this point the ratio of games to changes is fairly high; Progenitor is nearing completion as it becomes more and more balanced, so there tends to be multiple games before a needed change is discovered. *Had. I've been clean for a couple of years now.